At a time when anyone with a smartphone can be called a “photographer,” NYFA’s photography camps are focused on shaping the next generation of photographers to not simply be “good,” but to become truly extraordinary in an increasingly crowded field. 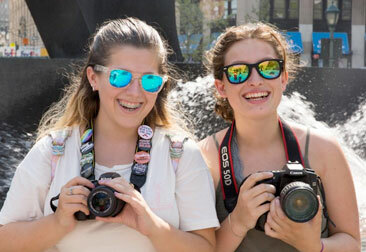 Students in the photography summer camps work with a network of professional photographers, industry professionals, and their fellow classmates to obtain new ways of looking at the same image while learning a wide variety of technical and artistic approaches. From the first day of the camp, students will be behind the camera, learning the craft of photography through a combination of in-class instruction, faculty-supervised workshops, and individual course assignments. Over the course of the camp, students will become familiar with and learn how to shoot in the many genres of photography, including Fine Art Photography, Photojournalism, Commercial Photography, and much more. The main goal of the camp is to train students to shoot and film images at a professional level. This means that students learn how to execute an assignment quickly and effectively, developing their own style of seeing and shooting the world that makes each image they take instantly recognizable as their own. To help them develop their own original voice, students study under our faculty of professional photographers who remain active in the field, shooting in the many different genres of photography. The photography summer camps at NYFA prepare emerging photographers for a future in the field and trains them to shoot photography at a professional level, providing them with a fun and challenging environment in which to grow as artists. All Photography Summer Camp students are required to bring with them to camp a digital camera with manual exposure control. Interested in learning more about NYFA’s unique Photography Summer Camps? Click here to learn more about the application process.